Pros: A really fantastic lead with excellent supporting performances! It’s Brecht. Cons: A little draggy in places. It’s Brecht. Our Verdict: Chichester is always worth a visit, and this is a good all-round production! I know the Brecht basics, and I know about the silent scream in Mother Courage, but I’ve never seen a Brecht play in a theatre before. This left me somewhat apprehensive; Brecht is a divisive figure, and I know that one of my fellow bloggers hates him with a passion! That being said, I’ve always enjoyed the shows in Chichester’s Minerva Theatre, and once I had found my seat (after a bit of confusion over rows and stairs… I won’t go into it!) I was pleased to see that the scene was set right from the beginning, with a pre-set of piano playing, whiskey drinking and cigarette-smoking men in three-piece pinstripes and trilby hats. The agenda of Brecht in The Resistible Rise of Arturo Ui (henceforth Arturo Ui) was simple; the play was written as a basic political statement against Hitler. Having fled from his home country of Germany the day after the Reichstag burnt down, Brecht was speaking out about the ridiculous rise of the infamous dictator, whose ascent was something that could, and should, have been resisted. The play itself is a combination of rhyming couplets and straight speech, and the performance a mix of stylised steps and realistic direction. None of this is a traditional premise for humour, but what was most shocking and unexpected about this production was that it really was funny! Set in a 1940s Chicago ravaged by depression, the play’s main character, Ui (played by Henry Goodman) begins the play as a bumbling, idiosyncratic and ridiculous character. As the play went on however, Goodman subtly transforms Ui into a petrifying gang boss. 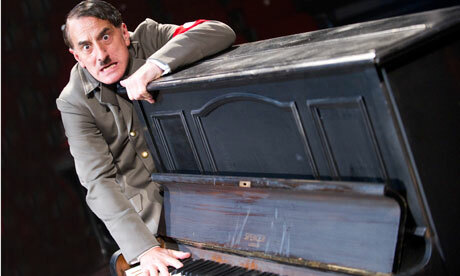 By the second act, without even realising it, the audience had stopped laughing at his hilarious attempts to goosewalk, do the Nazi salute and take on the many mannerisms of Hitler. Instead we were all frozen to our seats, gawking at what was going on before our eyes and staying silent, just like thousands of others did when Hitler was gaining control. Goodman was definitely the star of the show, although he was supported by a cast of spectacular theatrical talent (Joe McGann, William Gaunt and Michael Feast to name but three). His portrayal of Ui was nuanced and brilliant; I could see his understanding of every line he spoke, the journey his character took and his struggle for power. His short, wrenching epilogue, spoken no longer as Ui but as himself in his own accent, had a huge emotional impact that genuinely brought tears to my eyes. Meanwhile, the ensemble scenes gave an excellent feel for the powerlessness of the masses, with the physical performances driving more body-blows of emotional impact towards the audience. Another mention is for Ui’s intimidating and unnerving henchmen, who switched rapidly from a scene where the violence seemed like a joke, to another about loyal Ui-ists, serious in their endeavours to control. Whilst Arturo Ui is undoubtedly a strong performance, there were certainly weaker scenes, and this helped drag the show out to a total of almost three hours. Some of my desire for it to end sooner may be attributed to my own impatience, but some scenes (like the flower shop scene) seemed unnecessarily long and drawn out. Another slight problem I had was that some of Brecht’s rhyming couplets appeared forced, less natural and altogether a little out of place. Brecht is a must-see writer and one you shouldn’t be afraid of. His name carries with it a level of academic snobbery, yet I understood everything he was trying to say. Yes it’s a political piece, but it’s one which we can all relate to and understand. Despite it being written over sixty years ago, this production still clearly reminds us of the need to not allow those terrifying events to be repeated in the future. Please feel free to leave your thoughts and comments in the section below! The Resistible Rise of Arturo Ui runs at the Minerva Theatre, Chichester until 28th July.